The statewide trauma system was created by the Minnesota Legislature in 2005 (Mn Stat 144.602-144.608). Mn Stat 144.608 establishes the state Trauma Advisory Council (hereinafter STAC) to advise, consult with, and make recommendations to the Commissioner of HeaIth (hereinafter Commissioner) on the development, maintenance, and improvement of a statewide trauma system. The Commissioner of HeaIth is charged to both seek the advice of the State Trauma Advisory Council (STAC) in implementing and updating the criteria and to adapt and modify the criteria as appropriate to accommodate Minnesota’s unique geography and the state’s hospital and health professional distribution. The latter requirement is aided by the contributions of Regional Trauma Advisory Committees (RTACS). The statutory functions of the RTACS are to advise, consult with, and make recommendations to the STAC for regional modifications to the statewide trauma criteria that will improve patient care and accommodate specific regional needs. 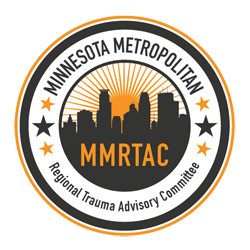 The Minnesota Metropolitan Regional Trauma Advisory Committee (hereinafter MMRTAC) is designated by the Commissioner to fulfill the statutory functions listed in item C. above for Anoka, Carver, Dakota, Hennepin, Ramsey, Scott and Washington counties. The Metropolitan Emergency Services Board serves as the administrative and fiscal agent for the MMRTAC.